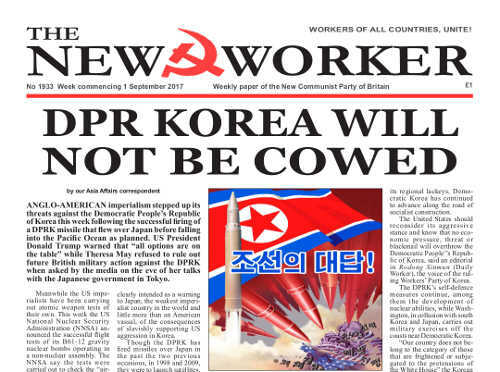 ANGLO-AMERICAN imperialism stepped up its threats against the Democratic People’s Republic of Korea this week following the successful firing of a DPRK missile that flew over Japan before falling into the Pacific Ocean as planned. US President Donald Trump warned that “all options are on the table” while Theresa May refused to rule out future British military action against the DPRK when asked by the media on the eve of her talks with the Japanese government in Tokyo. MARVIN Rees, the Labour mayor of Bristol, last week warned that the city’s council services are at breaking point because of yet more swingeing cuts. And he has called on everyone in Bristol to come out on to the streets as part of a mass ‘Rally for Bristol’ on 9th September at College Green. THE NEWS last week that the giant Tropical Storm Harvey was headed to Houston in Texas led to a heart-sinking feeling of hope that this time the richest nation on earth would cope better than it did over the tragedy of Hurricane Katrina — but also fears that it would be the same terrible story over again. So far the people of Houston seem to have fared a little better — there was some pre-planning to provide shelter for people who had to be rescued from their homes. The death toll reported so far is just 18 but that could rise a lot because rescuers still have a long way to go to reach all the homes that are flooded and, as with Katrina, there will be some elderly and infirm people who will succumb to the effects of the trauma even after they have been rescued.